Phew! The oral examination came and went like the wind. Good job to all candidates for officially beginning your PSLE journey! If you felt that the oral examination was a breeze, well done! If it had been more challenging then you had expected, cheer up and fight for the remaining 85% of PSLE English. You can still make a difference. Sign up with your email address to receive FREE Comparison Chart! 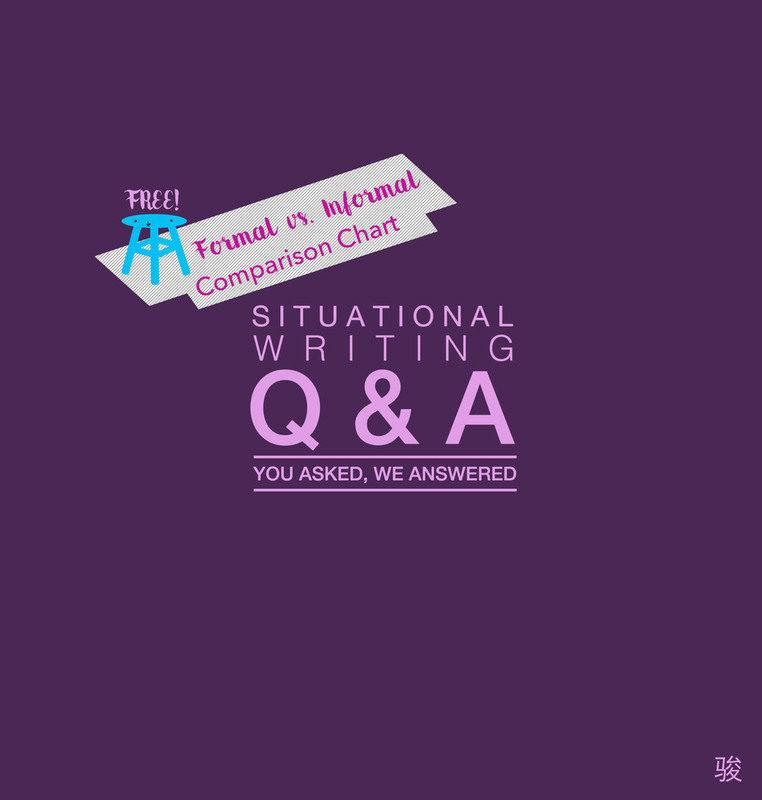 Due to the overwhelming number of questions on situational writing, I have decided to do a Q&A on situational writing to address some of these doubts that many of you may have too. Are you ready for the top 5 questions that parents have been asking about this component? I would like to begin with some general advice on this component. Situational writing makes up Paper 1 together with continuous writing (Composition). This component is graded based on content (6 marks) and language use (9 marks) and weighs a total of 15 marks. Out of the 1h 10 min (70 min) for Paper 1, a maximum of 15 to 20 minutes should be spent on situational writing so that 50 minutes can be spent on the composition planning and writing. Unlike the continuous writing component, situational writing has not undergone any change in its format. Hence, the question that will be appearing is similar to past years' questions. Bearing this in mind, I thought it maybe interesting to look at the situational writing topics from 2005 to 2018 (Updated to past 14 years!). What will the question for 2015 be? It is hard to predict as honestly, there is no fixed pattern in the tone or text type. Hence, there is no shortcut but just to be thoroughly prepared! As you begin or continue your last stretch of preparation, here are some burning questions that you might have and their answers to help you along. Q1. What are the text types that can be tested for situational writing? Situational writing can test many text types such as letter, email, report, postcard, notice. Some of these genres are more commonly used with a certain tone (e.g. postcard is usually an informal piece of writing) while others may be used for both formal and informal tone. Based on the questions set in the past 10 years, letters and emails are the most commonly tested genres for situational writing although a report and a post card have been tested once each. My advice: Most questions require pupils to write a letter or an email. Continue to practise these two text types but it will be good to let your children practise 1 or 2 exercises on other text types such as writing a report or postcard too. The differences are likely to be in the way the information needs to be phrased and organised and not so much in the format. (Look at Q5 for more.) E.g. A report may require children to explain their role clearly and to end off in a certain manner. Having at least one practice will let the children have a peace of mind and be prepared if such a genre really does appear in the examination. Q2. Salutation: Do I start with Dear Mother or Dear mother? Always start with uppercase to address the person you are writing to even if it is not a proper noun (a name). Other examples will be Dear Children, Dear Friends, Dear Grandma. Q3. May I quote words from the picture or character? "..."
Pupil A: When we asked for help, the waiter said, "Can you just wait?". Pupil B: When we asked for help, the waiter used a very rude tone to ask us to wait. The first one needs to be avoided as Pupil A needs to switch all direct speech to reported speech. Use Pupil B's response instead. Q4. How do I know whether the tone is formal or informal? It all depends on who you are writing to. If you are writing to an official authority or someone whom you are not familiar with (e.g. a principal of a school, a store manager, the operations manager of your school), the tone of the writing will need to be formal. If the writing is to a friend or a family member, it will most likely be informal. Q5. Are there any differences in format between formal and informal writing? Or among the different text types? Surprise number 1: The format is the same for most of the text types. Surprise number 2: It is usually unnecessary to write down a date, a title or an address. Whether it is formal or informal; a letter or an email, an invitation or a complaint, the format is pretty much the same. Everything in the format (Salutation and sign-off, paragraphing) should all be positioned on the left-hand side. However, from the updates we have received, do take note that reports do require a heading to be placed for clarity and it will be advisable to do so. Ultimately, it is wise to check with your school teachers their expectations in terms of format as every school has its own stand on how the formats should be. Remember, your teachers will be the ones grading your writing all the way until the Prelims. So, there is no difference between formal and informal writing? Tone: Formal writing does not require a greeting (e.g. How are you?) whereas informal writing does. This is important and demonstrates your understanding of whether you are using a formal or informal tone. "Yours sincerely" and "Yours faithfully" (depending on context. I will talk more about this in the next post) along with surname (Anna Tan) in formal writing. "Best regards" and without the use of surname (Anna) for informal writing. In my next post, I will be going through the process of doing situational writing and highlighting some key points to to take note of in order to achieve success in that component. Stay tuned for that and the free step-by-step situational writing revision card! Cannot find what you are looking for? Search our library of tips here! Sign up with your email address to receive news and tips fresh off the press! but don't take our word for it!